The superbly animated stop motion, entirely composed of 1980s Fisher-Price building toy 'Construx,' was lovingly crafted by Adam Brown over a year long process. The video depicts two Contrux guys crash landing on an alien planet and battling its robotic inhabitants. With plenty of visual nods to Sci-Fi pop culture like the 'Aliens' exoskeleton suit, the light tunnel from '2001: A Space Odyssey,' and classic arcade games like 'Sinistar' & 'Space Invaders,' 'Construxon Time Again' stirred far fonder memories than 'The LEGO Movie' managed. 'Construxon Time Again' originally appeared on the album 'Herbivore,' and now makes an appearance once again, along with remixes by Muta and Stephen Farris, on Jacob 2-2's new EP 'The Rec.' Available now via King Deluxe Records. 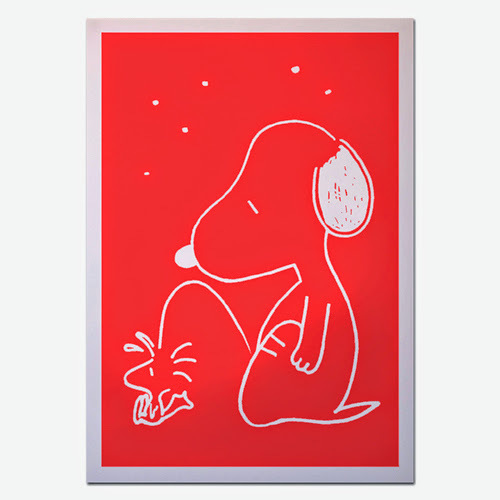 Re-printed from the archive... Bob 2 has reprised three of his classic cartoon-inspired print designs, each in a striking red risographed edition. The three designs are now available as A3 single-colour risograph prints, limited to a edition of just 10 signed and number copies per design. 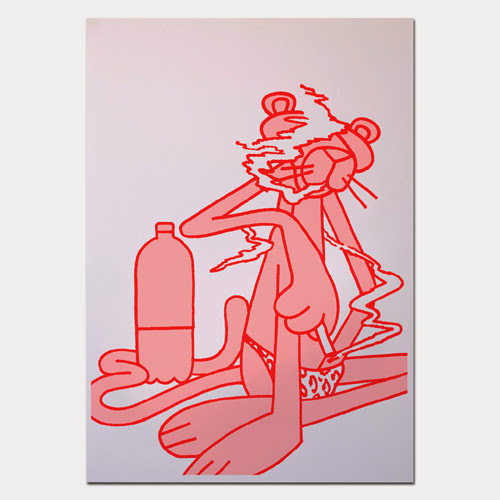 The prints are for sale via the Spray Gang online store, priced £25.00 a pop! 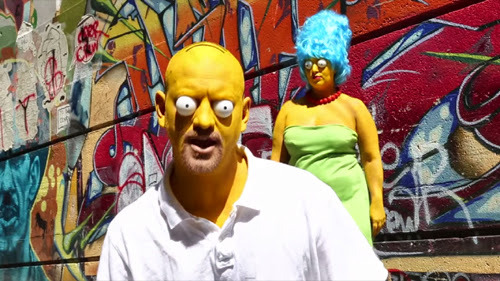 Influenced by the beloved television staple, and a Simpsons themed party Sauce hosted years earlier, Random Pictures director Stephen Gillis decided to take on the challenge of making the first live action Simpsons inspired music video. 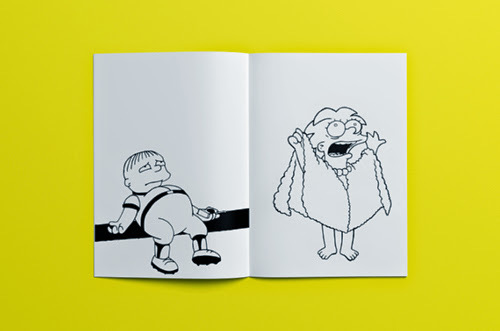 Also keep an eye out for our forthcoming 'zine 'Homage To Homer'... a horrific photographic collection of Homer Simpson costumes. Alan Hampton's new track 'Keep It In Your Dreams,' taken from his upcoming album 'Origami For the Fire' available on November 4th from Ash Productions, features a wonderfully animated paper-puppet stop motion music video from Steven Mertens. 'Weird Healing' started as a concept for an animated series with a focus on embracing the unknown with openness and a willing to understand. 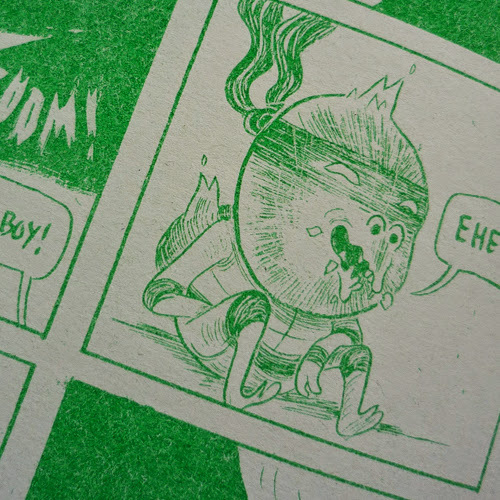 Overture's idea quickly developed into a single animated short, a comic series, a 'zine publication, an exhibition and even a little performance art! 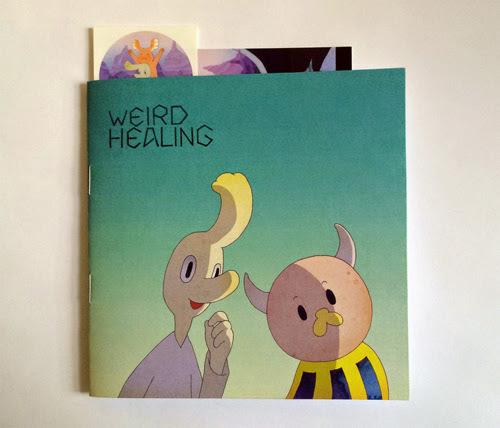 Watch the existing animated episode, which will still hopefully be developed into a full series, here and the 'Weird Healing 'Zine' is available for purchase in the Overture online store now. USA NAILS - Am I A Man Or Not? 'Am I A Man Or Not?' is the first single taken from London-based kraut-punk-noise-rock 4 piece USA Nails' debut album 'Sonic Moist,' released by Smalltown America, Bigoût Records, I Hate My Records and Unwork, on Monday 17th November. The horrifically grotesque music video features a shockingly good piece of stop motion animation from renowned horror claymation maestro Lee Hardcastle, in which a head slowly decomposes... Lovely! 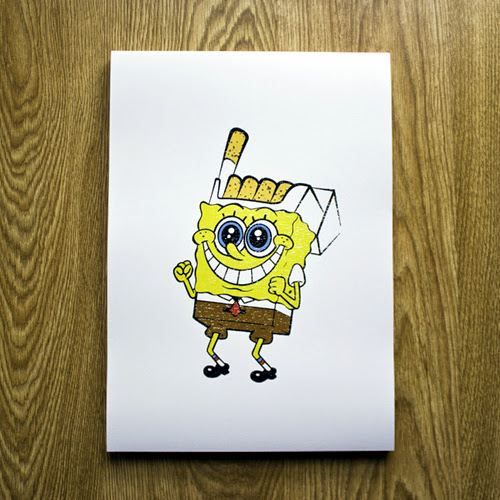 This SpongeBob inspired print by Imbue went up for sale via Artobox with a 'Pay what you like' price. This "art for everyone" approach allowed you to simply decide how much you wanted to pay, enter the amount and press 'Buy Now!' 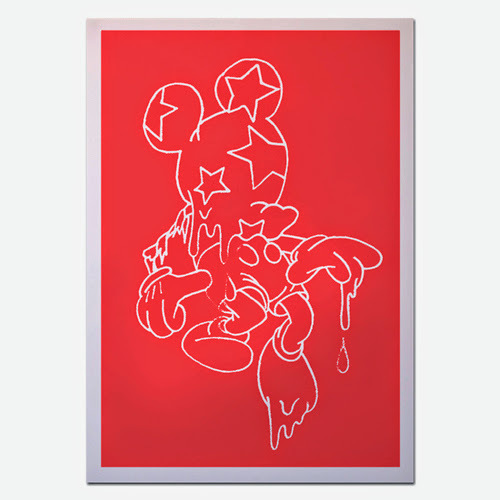 Unsurprisingly the print sold out almost immediately, but it's such a cool image we had to share it anyway. The ‘Light Headed’ full colour print on 300gsm white recycled paper, sized 29.7cm x 42cm, signed and number in pencil, edition of 50. 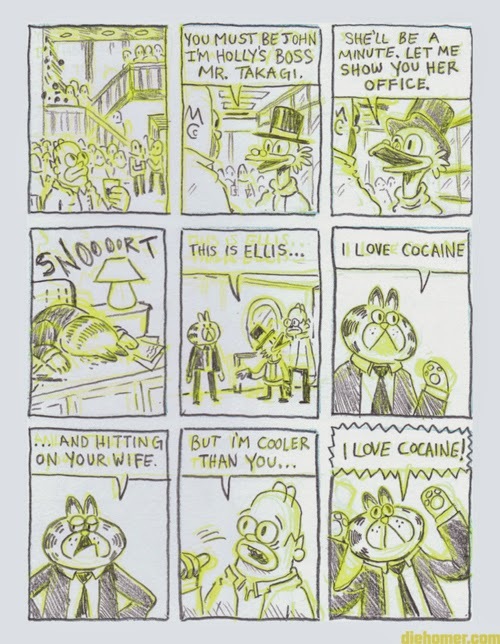 Inspired by her contribution to the Bartkira volume 1. 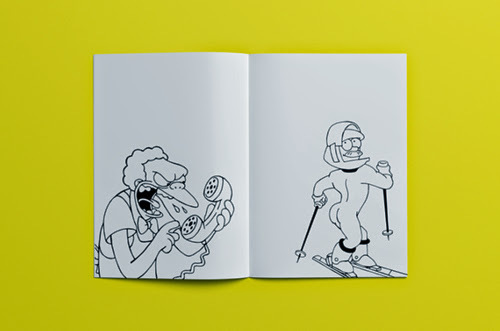 (pages 66-67), Lisa Ramsey directed and animated this bootleg Bart music video for Girl Talk & Freeway track 'Suicide' Remix ft. A$AP Ferg. The bootleg aesthetic and acrid colour palette lends itself so well to hip-hop... We absolutely love it! 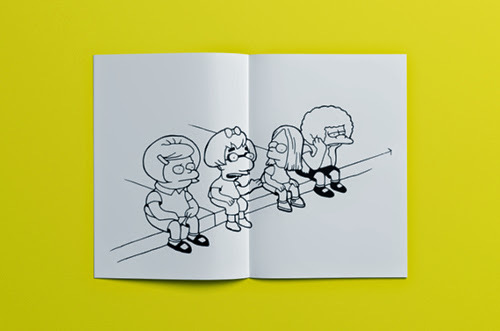 From Australian graphic designer Stefan Imbesi comes this superb 14 page 'zine capturing some of the most memorable moments and characters from 'The Simpsons.' 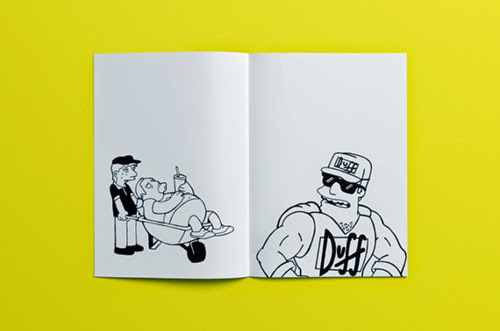 If you're a Simpsons enthusiast, 'zine collector or need a new colouring book, the 'Worse 'Zine Ever' is for you. 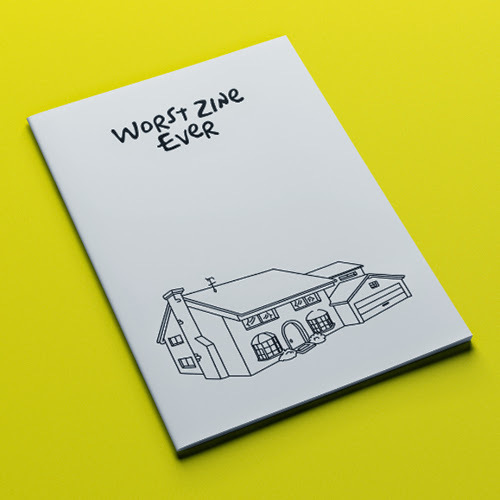 The 'Worse 'Zine Ever' is available in a limited run of just 50 copies, Black & White Risograph print on 150gsm Envirocare paperstock, priced $10.00 AUD via Stefan's online store. Director, animator and illustrator Robert Wallace aka Parallel Teeth created this animated promo for the 'Palace' EP, the new release from Stones Throw signee Hal Williams aka Pyramid Vritra. The concept behind the release was to shift the attention from the beats and to focus on the storytelling in the vocals, each narrative representing a different "room", with the album creating a cohesive "corridor of music." The promo features the tracks 'Palace,' 'Retrograde' and 'Track Three,' all sublimely illustrated with a series of rooms equally steeped in classical architecture and science fiction weirdness. 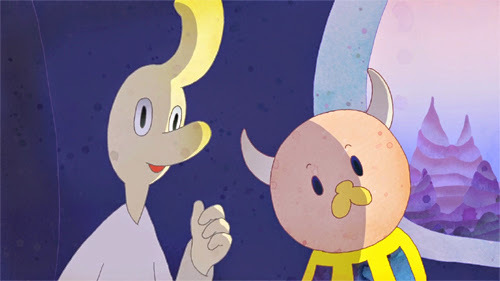 Hungarian animator Tomek Ducki, who recently appeared on the Animated Review with his cutesy and psychedelic music video for 'Unicorn' by Basement Jaxx, is back with another music video crafted in a very different style. The music video for ZHU's 'Paradise Awaits' features a combination of 2D and CGI animation overpainted in negative, with Tomek hand-painting a few thousands pictures with acrylics, watercolours, crayons and ecoline paint... Stunning! The 'zine has been sold at several independent publishing fairs this year, including ELCAF, The Bristol Comic and Zine Fair and Safari Festival, but it's now finally available to purchase online. 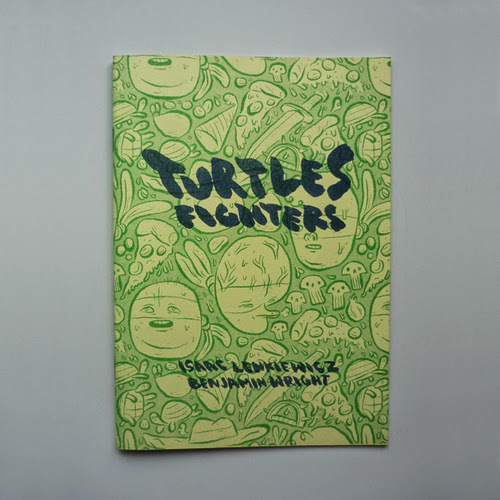 'Turtles Fighter' is now available through Isaac's online store for just £3.00! 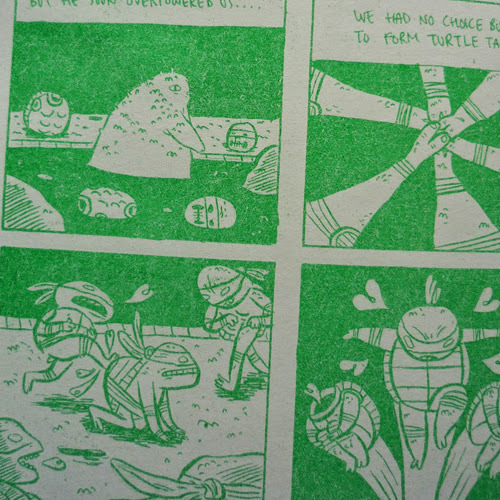 If you like the look of this, you should also check out Benjamin's hand-painted Turtle Fighters Badges and Jack Teagle's 'Turtles Fighters' 'zine too. 'Brain Lapse' is the latest in Jake Fried's mind-bogglingly detailed and mesmeric series of "hand-drawn experimental animations." Unlike the previous installments, 'Brain Lapse' also utilises collaged elements, alongside the ink, gouache, white-out and coffee typically used in their composition. Spanish DJ due The Zombie Kids enlisted illustrator Sawe and director Tomás Peña to create this brightly-coloured madcap music video for their remix of 'BOOM' ft. Snoop Dogg. The zany escapade sees a blue-skined youth, a yellowed old man, and a portly pink policeman vying to be the best graffiti artist, supported by a bizarre cast including Snoop, a pink poodle and a twerking pizza slice! "Lemon cranberry apple banana cucumber orange lime are a selection of fruit fruit." Mark Prendergast animated the new video to accompany Bambooman’s track 'Clasp' using nothing but bouncy balls, everyone’s favourite childhood play thing, and lots and lots of sandpaper to slowly reveal the psychedelic, swirling patterns hidden within. The video is initially comprised of an animated series of lurid bouncy balls spinning and bouncing in perfect synergy with the musical beat. The amazing visuals really kick in when the sanded-down shots, much like a strata-cut animation, slowly reveal hypnotic pools of swirling colour. Homer has been cast a John McClane battling German terrorist Hans Gruber and his cronies during a Christmas party at the Nakatomi Plaza in Los Angeles. 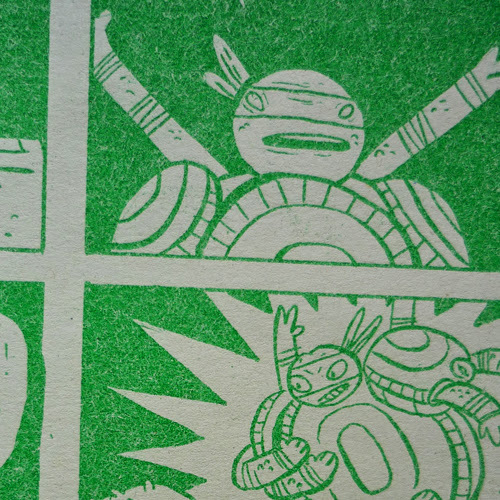 The supporting cast are played by a variety of iconic characters lifted from comics, cartoons and video games... Including Moomintroll, Sonic The Hedgehog, Angry Birds, Scrooge McDuck, Garfield, Skeletor, Charlie Brown, Goku, D.W, Gonzo and, of course Marge Simpson as Holly Gennero. 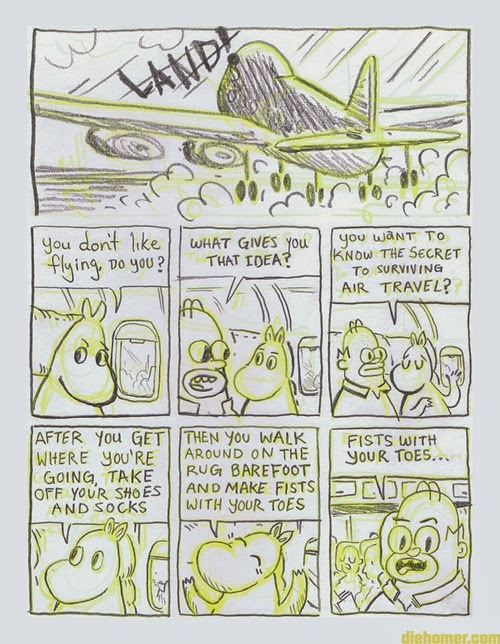 Initially released as a 'zine for the SPX Independent Comics & Cartooning Festival last September, the sell out success is now being serialised on Tapastic (www.diehomer.com), whilst the first 22 pages are already available for digital download on Gumroad for $3. 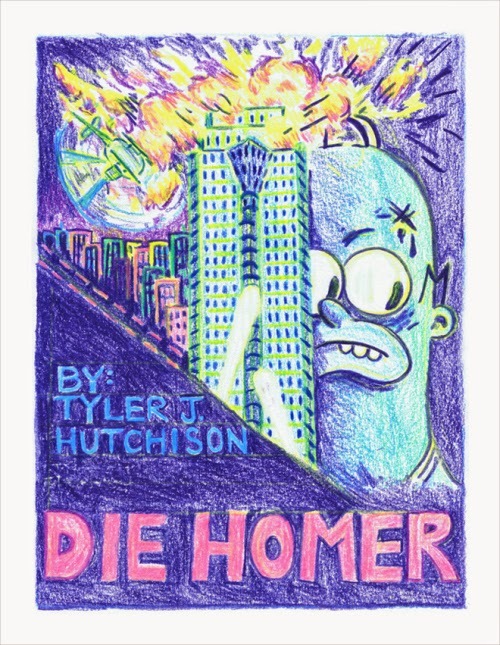 The first volume of 'Die Homer' concludes with McClane (Homer) dropping Marco's (Skeletor's) corpse onto Sgt. Al Powell's (Charlie Brown's) car, alerting the LAPD! 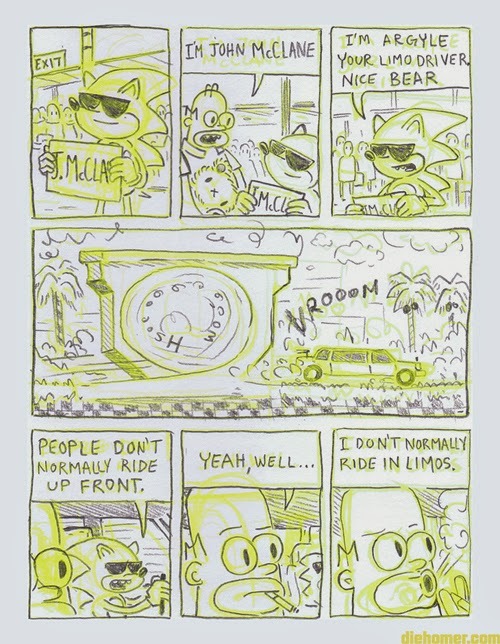 With plenty of the film still left to adapt, we're already eagerly awaiting Die Homer's return in the second volume, which is supposedly going to be unveiled at Thought Bubble this November. Ross Hogg's 'Scribbledub' looks like a scratch film animation, in which abstract visuals have been scratched and painted directly onto 16 mm film, before being projected. Inspired by the masters of this technique, Len Lye, Norman McLaren & Stan Brakhage, this latest animated project from Ross, a break from his previous more illustrative films, looks hugely intriguing. "'Scribbledub' explores the dependent relationship between image and sound - the 'scribble' creates the 'dub', the 'dub' informs the 'scribble'." David Luepschen's latest multimedia animated short, complete with freakish puppets, bizarre stop-motion characters and lurid sets, is an ode to Chatroulette, and the weirdos you're likely to encounter. Eoin Duffy's 'The Missing Scarf' is finally online after an extensive and unbelievably successful festival run. Lulled into a false sense of security with it's charmingly cute visuals and the narrative tone of a child’s storybook reading courtesy of George Takei, the short quickly descends into a foreboding exploration of existential nihilism. 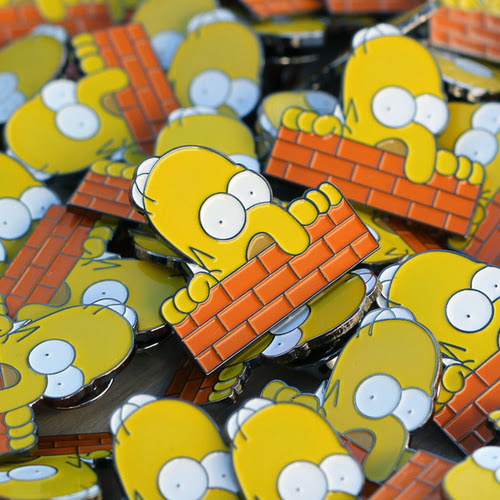 45RPM has just released a T-shirt and enamel pin badge featuring a stupidly brilliant mash-up of 1940s graffiti icon Kilroy Was Here & Homer Simpson. 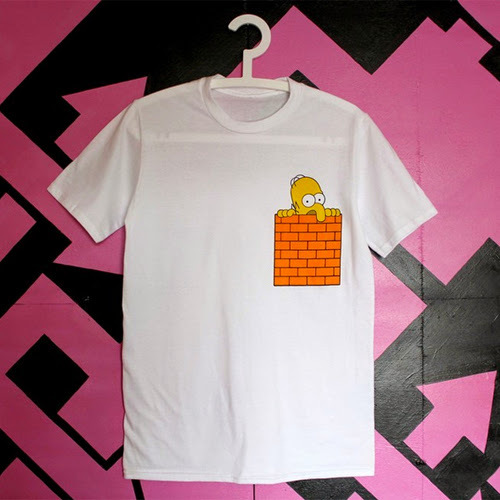 The T-shirt sees a droopy-nosed Homer peeping over a brick patterned faux chest pocket, with the phrase 'Kilroy Was Here' emblazoned over the back. For an unbelievably bargainous £25.00 you can get the T-shirt/badge/sticker/keyring combo pack... That's four idiotic things for the price of one! Head over to www.45rpm.bigcartel.com and pick one up now! This new music video from independent studio ONIONSKIN, made to accompany the track 'Dream Of Kemuriyoru', taken from Mori Wa Ikiteiru's second album 'Good Night', sees a panoramic illustration brought to spectacular life through the magic of barrier grid animation. Take a look at Ariel Victor's animated tribute to his favourite Childhood cartoons. Featuring: Hey Arnold!, SpongeBob SquarePants, The Powerpuff Girls, CatDog, Pokemon, The Little Mermaid, Blue's Clues, Road Runner and Sonic The Hedgehog! Caleb Wood has perfected animating botanical beauty in this new music video for Dana Williams' track 'One More'. SBTRKT's new release 'Wonder Where We Land' is the second album offering from the producer Aaron Jerome and follows his 2011 self-titled debut. For the new single 'New Dorp. New York', featuring Vampire Weekend's Eza Koenig, SBTRKT have released their first animated music video. Collaborating with director Fons Schiedon and A Hidden Place, the video features the sleek mask-wearing dog (as seen on the album artwork) stalk the smokey alleyways of New York city! Following on from 'Sophomore', Greek graphic designer and animator Constantinos Chaidalis is back with another sublimely animated collage. Titled 'Senior', this new short explores anticipation, loss and sorrow.